Anyone who’s been to Thailand has probably enjoyed a Traditional Thai Massage . 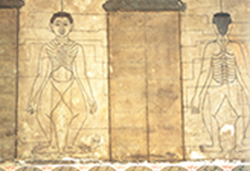 The ancient massage practice, which is over 2,500 years old, is a unique combination of Indian yoga stretching and Chinese acupressure. The therapist manipulates the limbs into various yoga postures, while at the same time stimulating the flow of vital Chi energy. The result is a deeply relaxing, serene and profoundly healing experience. Dr. Pailin has been practicing and teaching Thai massage for 15 years. She learned from the best — studying at the renowned Wat Po temple in Bangkok, where she had the unique privilege to study directly with the headmaster. You can read more about Thai Massage and Pailin in this article from CONDE NAST TRAVELLER.